Just the other day I got embroiled in a bitter twitter war. Opinions were tossed to and fro and my ego went from wonderfully swollen to very sadly deflated in a matter of minutes. The end result was me having to skulk away, tail firmly tucked between my legs, and a sulky toddler-esque pout taking hold of my lips. Twitter can be detrimental to your mental health, dear readers! Okay, so I'm being ever so sliiiggghtly melodramatic, but it's true, I was involved in a very opinionated debate over eggs in salads. The general consensus seemed to be that egg, in most forms, were great in a salad - boiled & sliced, poached and runny, even fried - but scrambled egg in any other guise except breakfast was simply a no-go zone. And most definitely *not* something to be included in any decent person's salad. "But", I whimpered, "I've had this idea in my head for days! Surely it can't be that bad?" I was met with stony silence and (more than) a few "Um, yeah, it is that bad"s. Ho hum. So what did I do? Well, I tried to reason my way out of this predicament, but those twitter goons* just weren't budging. So I climbed into the passenger seat of our car, sighing heavily and subjected TheHusband to my moans, groans and whimpers all the way home. I just couldn't believe that no-one shared my vision. I mean come on! Could I be *that* deluded? And then TheHusband opened his mouth and uttered this magical sentence: "If you believe in it, then go for it!" (or something to that effect). So, I did. And to all the naysayers, I'd just like to say - eat my shorts. As a certain very mature cartoon character used to say. This salad wasn't just good, it was GREAT. 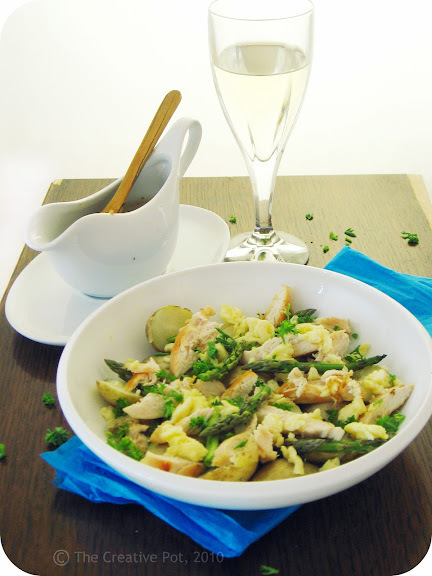 The combination of lightly fried chicken, still-warm baby potatoes and tender asparagus was an absolute knock-out with the creamy morsels of scrambled egg scattered on top. Because the goal, after all, was not to have a scrambled egg salad (that *would* just be weird), but rather to use the scrambled egg as a sort of garnish. Much like one would use feta cheese. Or pumpkin seeds. ** It rounded this salad off perfectly, as did the sweet and nutty mustard dressing I poured over liberally. So the only question that remains is this: are you brave enough to taunt the twitter experts and indulge in this salad alongside me? If you really can't stomach the thought of scrambled eggs in a salad (although really, you should be ashamed of yourself for not having the guts to put on your big girl/boy pants), feel free to substitute the scrambled eggs with crumbled feta cheese or pumpkin seeds. Smoked chicken can also be used if you're in a hurry (although, to be honest, the chicken cooks up pretty quickly). 1. 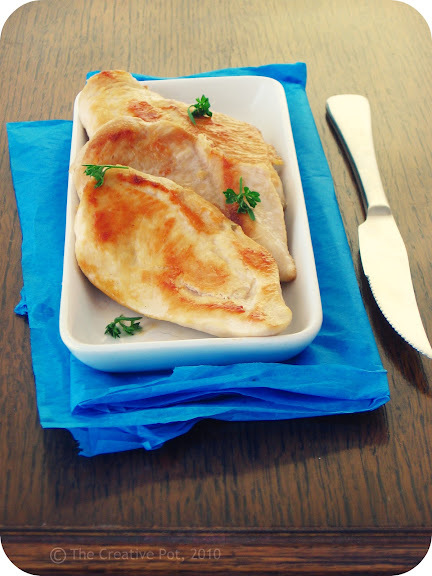 Heat macadamia nut oil in a frying pan over high heat, add chicken breast fillets and quickly sear on both sides. Sprinkle with salt and continue frying over moderate heat for 5 - 7 minutes, or until cooked through and nicely golden all over. Remove from heat and allow chicken to cool thoroughly before slicing into strips. 2. Meanwhile, steam or boil the potatoes until soft, then halve. Combine with chicken and asparagus in a bowl. 3. Prepare your dressing by whisking all the ingredients together in a small jar, then pour over chicken salad and toss gently to coat everything with the dressing. 4. Lastly, prep your eggs by whisking them, together with milk and a touch of salt in a small bowl until frothy. Heat sunflower oil in a small frying pan over high heat, then add egg mixture. After a minute, turn heat to medium-low and start drawing through the eggs with a spatula to scramble them. The eggs cook very quickly and shouldn't take more than a couple of minutes. When they look almost done, remove from the stove top - they will still cook for a further few seconds until the perfect consistency. They should still be soft and creamy when you're done and not at all dry. 5. 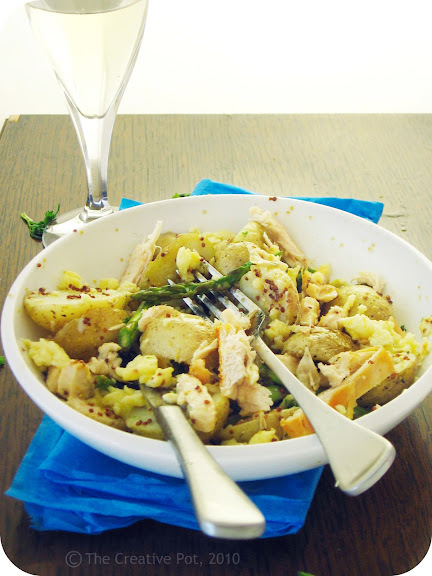 Divide salad amongst individual serving plates or bowls and top with broken up bits of soft scrambled egg. Enjoy immediately. Using macadamia nut oil gives a lovely golden glow to the chicken breasts that I have not been able to achieve with olive or sunflower oil. Of course, it also lends magnificent flavour. Try it, you might just be pleasantly surprised. I did say that it was your salad and you could sprinkle whatever you liked on it! But seriously, I am still not totally convinced. BUT for YOU! and in the interest of SCIENCE...I will make this salad. Because as my mother used to say when we were little "How do you know you don't like it until you try it?"*. *She still says this. I got her back by making her eat sushi. HA! I'm certainly open to trying this - I have come to trust your recipes and I love how you adapt ideas and make recipes your own! After all, isn't that how chocolate-chilli sauce on steaks and other "fusion" cooking ideas came into being and are now all the rage? Well done Marisa!! Totally a testament to the idea that you should always go with your gut instinct. Reach for the stars. And all that jazz. I've never thought about putting scrambled eggs in salad before. But girl. I trust your instincts. They've never led me astray before. WOAH. That combination sounds incredible. Totally had to bookmark it. Hmmm ek sal bietjie daaroor dink ;-) Wat het jou die idee gegee? Well done, I bow down to your excellence and determination!!! Looks absolutely fab!!! Mmm what a delicious salad. So many lovely ingredients. I especially like the pairing with the sweet mustard dressing. Yum!